Your mojo hasnt gone anywhere sweetie this really is so so beautiful I love the colour. 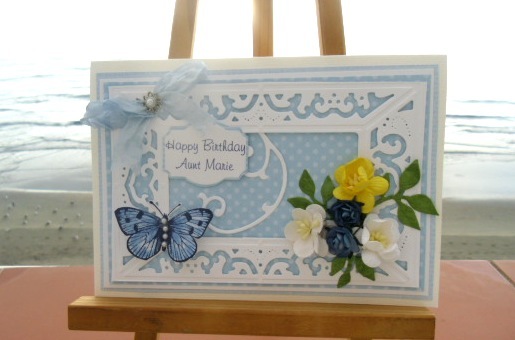 this card is so very gorgeous and elegant! Not sure where you think your Mojo is Sylvie but this card is absolutely beautiful. I don't think you need to worry - your mojo is in working order!! I do like this - so very pretty. Love the butterfly and pretty bow! Thanks for playing along with St Luke's Charity Card Challenge. I'm sure your friends Aunt will love it. Look forward to seeing you in November!!!!! If not for a workshop, will get together for a coffee. 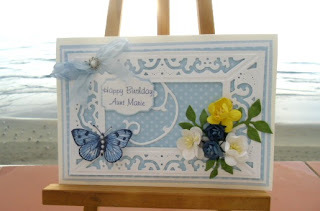 There is no way she wouldn't like this htis it is stunning, isn't it funny that some cards just won't come together? This is stunning Sylvie - I am sure she will LOVE it. Beautiful Silvie. If this was in a shop, I`d buy it, love it so much. Thanks for joining us again at St Lukes.